Clear enough space to boot the system. Access the system over the network and give the machine a good clear out. I talked someone non-technical through the boot process. But he said that the prompt for single user mode was not being shown. So we decided to wait until the IT expert was on site. I still thought this would be an easy fix. There were no usable backups of the system, so that option was also out. Try booting from Boot and Root floppies and see if we could mount root and remove some files. I decided it would be best to try image the system and restore it to a virtual machine to prevent any potential further damage. This is when we came to the next problem, seriously old hardware! This machine has no USB Ports – so it was not possible to use an external drive to image the internal drive. 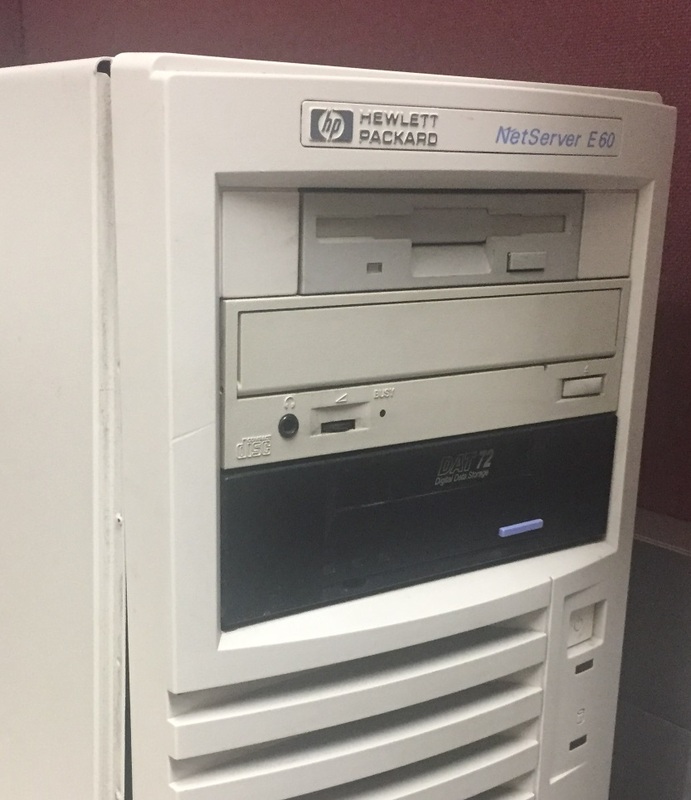 Server was unable to read a ISO burned onto a CD-R.
We were able to find an old IDE CD-Drive and put that into the machine. We were then able to boot an old version of CloneZilla. Although we could boot CloneZilla, it was not able to recognise the network card in the machine, so that option wasn’t going to work either. At least it did recognise the disk, so there was a bit of hope there. Brad called some local IT shops and we able to locate various bits of old hardware, IDE drives, network cards etc. So we had some more options. We tried the 3com 3c905 card in the server but CloneZilla still didn’t see. This was starting to seem like a hopeless route. As a last resort I suggested that we try to use the Ubuntu version of CloneZilla to see if that would have any better results at seeing the old hardware. We had to find and download an old release because the recent versions require 256Mb Ram and this machine had only 128Mb. The Ubuntu version of CloneZilla was able to see both the on-board network card and the 3com card, so we began the process of imaging the drive across the network. I was confident that once the image of the machine was restored into a virtual machine, that the system would running up and running quickly. The Image was restored into VMWare Workstation 14 and and things seemed quite positive. The machine could not boot because there was no BTLD (Boot Time Load Driver) for the LSI Logic SCSI Controller, I know how get that in place easily. Using Boot and Root floppies to access the HTFS root file system. I used boot floppies and tried to mount the root file system, this didn’t work because SCO was reporting that the Superblock was bad and that the magic number was wrong. After a period of trying different things I gave up and restored the image again, but this time on to an IDE drive instead of a SCSI LSI Logic drive. This was much more successful and I was able to boot the system to the same point the customer was getting with the out of space message. I Used boot and root floppies to mount the root file system. The root file system had some corruption but fsck was able to take care of that. I then removed enough files to create space to boot the system into multi-user mode. Although it booted, I was unable to get a login prompt. This was because the physical system was originally configured to use a DIGI Serial over Ethernet Server. The serial server generated so many errors that a login prompt could not be shown. Multi-User Boot and editing /etc/default/boot configuration. I cleared out the Digi configuration and booted the system using a custom boot string. After that I edited /etc/default/boot to reflect the new drive setups and disabled the existing SCSI driver. I reconfigured the network, cleaned up the root file system and handed it over to for testing. It all works fine and SCO is now running on VMWare Workstation 14. The data backup routine will be changed to work over NFS to a file instead of a tape device. Printer will be reconfigured from parallel to HP Jetdirect. My gratitude goes out to Brad who was incredibly enterprising and patient with the old hardware. I could not have asked for a more helpful remote companion to work on this with me. Key Points if you are in a similar situation with an old SCO Openserver System that needs recovery. CloneZilla can take good images of a SCO Openserver System. Ubuntu Version of CloneZilla seems to have better hardware support for older systems than the stable release. You are probably going to need boot and root floppies, so make them while your imaging is taking place. If you need help virtualizing your SCO system, please get in touch here.